Mainly covered in purple hue, an iris is the symbol of royalty and it’s full of enchanting stories of gods and legends and myths. Iris flower meaning is highly associated with heroism, valor, and prowess, which is also adopted in many cultures around the world. The flower iris is known to be planted on the grave of a woman, symbolizing the guard for the woman to arrive at heaven safely upon her death. Iris is an ornamental flower and it is commonly found in the Mediterranean area; mainly in France, Italy, and other parts of Central Europe. Clearly, an iris is a perennial with thick rhizome and its stem can reach up to 40 inches high, which leaves arranged in two rows and flowers are pleasant-scented. As beautiful as its appearance, iris flower meaning used to be regarded as nobility, as it also the symbols of queens and kings in ancient dates. According to the legend, the name iris is derived from Eiris, the Greek goddess, whose task is as a messenger between the gods in heaven and those of creatures of the earth. The tale tells that the iris flower meaning can be translated as “rainbow”, highly connected to the emergence of the rainbow; that is, when the colorful lines turn up, the goddess is on her way to earth to convey some messages. While some argue that the multi-colored of iris flower is derived from its meaning “rainbow”, it is actually traced back to its root in the Greek mythology. The meaning of iris flower as a rainbow is often construed as the colorful robes of Eiris, as a flowing veil when the goddess transcends air to bring favor upon the earth. The Greek myth also stores another version of iris flower meaning, which is poise. This meaning is depicted from the messages carried by Eiris that are composed of forcefulness, eloquence, and communication so that the flower embodies the same idea. The many significations of iris make it easier to get the flower as a gift and expressing your feeling. Iris flower meaning can be different, depending on which area it’s regarded or even which color you are carrying to give away. Ever since the iris is depicted as the flower of Eiris, daughter of Thaumas and Electra, it’s no wonder that the kings and noble-born of ancient days also regard this flower highly. Iris meaning as majesty and power; apparently, this translation is dedicated to the Roman deity, Juno, who used the flower as the forerunner of his scepter. In ancient Egyptian times, iris symbolism is highly regarded as the symbol of wisdom, faith, and valor. Some evidence shows the flower of an iris is placed on the scepter of the Egyptian kings at that time, even chiseled on the brow of the Sphinx. 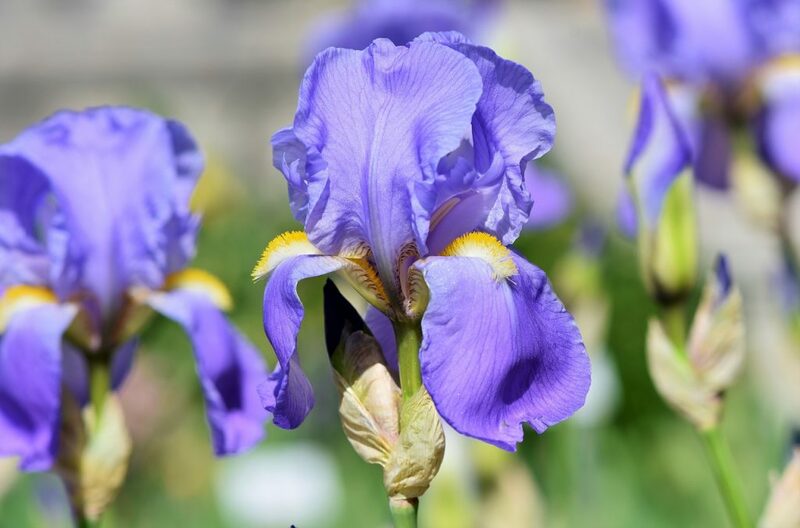 The ancient Egyptian kings also believed that iris is the symbol of the connection between them and heaven, traced back to Greek mythology. While in our familiar culture flower is associated with girls’ deed, Iris is used extensively during the Japanese spring festival-not for girls, but for boys. The flower expresses heroism due to its blue color appearance, which also represents royal blood. Due to its scented nature, the iris is often used in fragrance-making and perfumes. The Japanese culture also regards iris flower meaning as purifying and has healing properties. It is believed that people carrying iris will be protected against the evil spirit, even purifying the energy and has the ability to protect the people who wear it. In modern Japanese culture, the flower iris can be found as a kimono pattern, as a symbol in paintings, and in Japanese haiku. People of the old Victorian era considered the iris symbolism as the representation of courage and admiration. They used to bring a bouquet of purple iris blossoms that represent compliments and wisdom to the person they highly regard. Different color of the flower also attached to a different meaning, like the blue iris, which reflects faith and hope. I don’t know if you know but the symbol of the French Monarchy, the fleur-de-lys, is derived from the beauty of this purple perennial. During the medieval era, its significance often resembles as a sword or flag, that is embodied the symbol of royal family, heraldry, and noble heritage at that time (influenced by the Italian Renaissance). The people of Chinese see the flower as the summer spirit, as its petals flowed by the wind to mimic the form of butterfly wings. 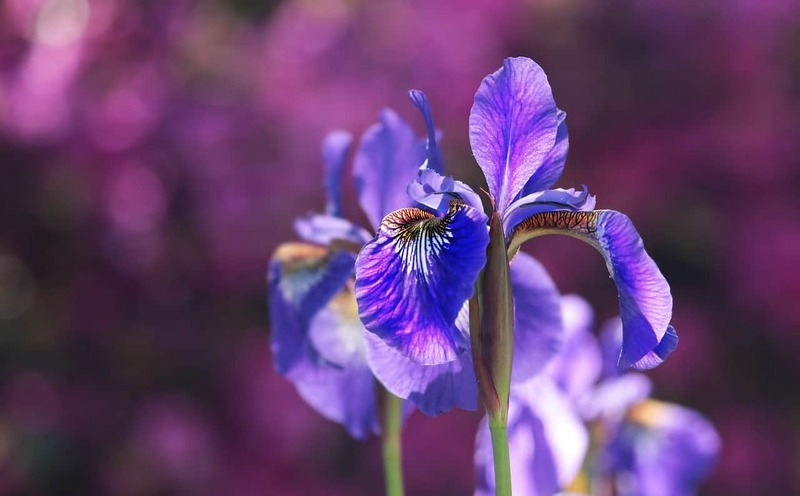 Judging by the form of the flower itself, the culture marks iris flower as the purple butterfly that dances through the early summer, embracing warmth and joy. While iris doesn’t only cunted for its royal purple color, other stains also bring different meaning and symbolism. This is the color of hope and faith. A bouquet of blue iris flower is the perfect gift to show your support for someone special or simply to complement them to achieve their goals. Simply captivating just from the color itself, the white iris symbolizes innocence and purity. Often used as a wedding decoration, the white iris is sending out the message of gentleness and virtue. While the color yellow signifies passion and eloquence, the yellow iris is considered a perfect gift to express friendship to your buddy or a family member. Yellow iris flower also makes a perfect decoration to cheer up the mood of a room. The iris symbolism does cover not only the realms of a certain culture, but also religion. In Christianity, an iris is closely related to the honor of Virgin Mary. It is said that the sword-like appearance of its leaves resemble the sword or emulate the grief that ripped Mary’s feeling as Jesus is crucified and tortured. In the modern world, iris flower meaning also related to its medical significance that is often used to treat a cough, gastric (when used to make tea), kidney problem, bladder disorder, etc. This flower also incorporated in the manufacture of cosmetic products, powders, and toothpaste.